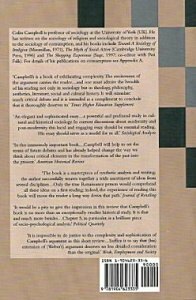 `Campbell’s is a book of exhilarating complexity. The excitement of the argument carries the reader…and one must admire the breadth of his reading not only in sociology but in theology, philosophy, aesthetics, literature, social and cultural history. It will stimulate much critical debate and it is intended as a compliment to conclude that it thoroughly deserves to.’ Times Higher Education Supplement. `An elegant and sophisticated essay…a powerful and profound study in cultural and historical sociology. In current discussions about modernity and post-modernity this lucid and engaging essay should be essential reading. His essay should serve as a model for us all.’ Sociological Analysis. Colin Campbell is professor emeritus at the University of York (UK). He has written on the sociology of religion and sociological theory in addition to the sociology of consumption, and his books include Toward A Sociology of Irreligion (Macmillan, 1971), The Myth of Social Action (Cambridge University PressPublishing business of the University of Cambridge; granted letters patent by Henry VIII in 1534 world's oldest publishing house; second largest university press in world; (http://uk.cambridge.org/aboutus/infoforauthors/electronic.htm) tells you how to submit manuscripts electronically, but only deals with non-fiction. , 1996) and The Shopping Experience (Sage, 1997: co-editor with Pasi Falk). Details of his publications on consumption has been added. "The Romantic Ethic and the Spirit of Modern Consumerism was first published by Basil Blackwell of Oxford in 1987. A paperback edition appeared two years later, while in the following five years it was reprinted four times. However although the intervening years have seen the appearance of Italian, Portuguese, Slovenian and Chinese editions, no copies have been available in English since 1998. This Alcuin Academic edition has therefore been published in order to fill this gap, and more specifically to meet the needs of those academics and students who have contacted me over the past six or seven years in search of an English-language version of the book. Naturally I have considered writing a revised edition (which indeed some critics, as well as a few friends, have suggested is long overdue). However I have decided against doing so at this time, preferring to direct my energies elsewhere. This is, however, a task that I do intend to undertake in the near future; and hopefully in time for the twentieth anniversary of the book’s first publication in 2007."